Claiming is STILL OPEN at HP Next Gen Fest! Hello lovelies! 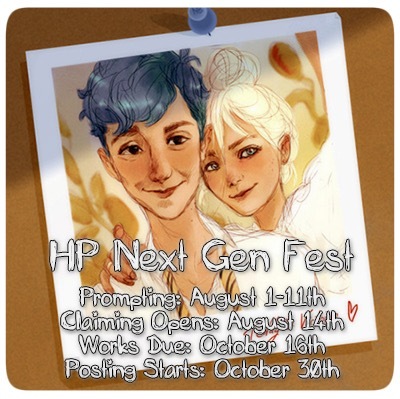 I wanted to post a quick reminder that claiming is still open over at hp_nextgen_fest! Submissions aren't due until October 16th, so you have plenty of time to create something awesome! We're in particular need of artists, so if you're artistically inclined and looking to participate in an AWESOME fest of awesome, please consider taking a look at the prompts and seeing if anything catches your eye! Same! I'll keep my fingers crossed. Right now we just have one artist signed up, so I'm hoping some more come on board!